Omni Accounts is a sophisticated accounting software package that Chris and Andy Kudla, the founders of CK Services, have developed with pride and passion. Built on more than 30 years of trading success, CK Services has a sound understanding of the accounting and ERP system requirements for all businesses, large and small. Andy Kudla said, "Every business has to have an accounting package in place with adequate reporting measures. Omni Accounts is driven by the desire to have a successful and highly valued product in the market place." CK Services is headquartered in Durban, South Africa and supported by offices in Johannesburg, Cape Town and Port Elizabeth. The company's vision of having a world-class product in the market place has ensured that its business dynamic is proactive and customer orientated. Consequently, CK Services has worked very closely with many enterprises, accountants, and a substantial dealer network throughout S.A. and neighbouring states to develop an efficient support infrastructure, critical to the smooth and efficient commissioning and on-going support of its 25000 users. CK Services strongly believe in dealing ethically with both its customers and its suppliers and strives to provide a personal service. Andy Kudla commented that in business one can never be complacent. While a big user base is important so is making sure that these customers are satisfied customers. He said, "As the business grows they will come back and spend more with you. The customer must see value in the product and it must be sustainable." Therefore it is no surprise that there is growth in the word of mouth referrals that Omni is receiving. The brand has moved to number three in the market place and sales are currently up 36% from last year. CK Services also recognises that its staff members are the foundation upon which the business has been built. 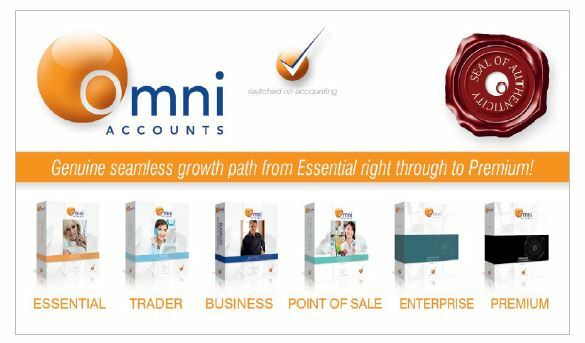 Omni Accounts was born on the basis that its aim was to address a range of business needs from small to fairly extensive through the use of one product. The "one product fits all" design differentiates itself from other products in the market place. Research and development costs are lower, which ensures that the product is good value for money. However, Andy Kudla said, "Research and development has been exacting and we know we have a solid product. When we started development on the windows application in the change over from DOS applications, we were not shy and rewrote the programme from scratch. This allowed us to bring years of experience into creating a robust and top-notch product." Young users often only want a basic package and not a highly sophisticated product which, Omni Accounts is able to provide. The programme is able to grow with the business as the "built in dimmer" switch allows for expansion. Having only one product also ensures that there has been much attention to detail. Good software development means that the system is intelligent. The large number of parameters in place enable simplistic data ,capturing as such even low skilled staff members are able to capture data with ease and do not have to guess which field to use which creates opportunities for error. Omni Accounts has a large number of special applications from stock control to job costing and manufacturing requirements. Of note is that the wide range of applications also ensure that the programme is flexible and has unlimited reporting capabilities. This feature is essential for making sound business decisions. The on-site commissioning processes for large applications is smooth and cost effective. Andy Kudla said, "Having one product is a huge market advantage as the total cost of the package and commissioning is highly competitive in comparison to other similar products." Omni Accounts also believes in providing its customers with the tools necessary to make their software work. A range of courses designed to suite the entire spectrum of end-users, from beginners through to experienced endusers working with specialised aspects of the software are offered. Chris and Andy Kudla together with their young, dynamic succession team, remain committed to continue to build CK Services into the preferred accounting software developer in South Africa.